According to Google, both the 70th and hundredth anniversaries are honored with platinum gifts. Since Earth Abides is closing in on the 70th anniversary of publication, George R. Stewart’s epic work is approaching platinum. The novel was published on October 7, 1949. It immediately caught the attention of reviewers for its well-written, epic tale of humans living in a world they no longer dominate. One later reviewer went so far as to call it “a second work of Genesis.” With its title from Ecclesiastes, and the old testament rhythm of its language, it is almost biblical in its feeling. Stewart later insisted he didn’t intend it to be a religious work. But even he admitted that there was “a certain quality there.” The language was one reason. Stewart taught himself Hebrew before he wrote the book. He wanted to translate portions of the Bible into more-modern English. He was surely influenced by the style of ancient Hebrew. The book has had enormous influence. Stephen King based The Stand on Earth Abides, Grammy-nominated composer Philip Aaberg wrote “Earth Abides,” Jimi Hendrix was inspired to write “Third Rock From the Sun” by the novel (his favorite book), other authors and scientists honor Stewart’s works. It is published in either 20 or 27 languages, depending on who you ask. There is some talk of producing a film version of the novel. The novel has never been out of print –no thanks to its original publisher. Random House decided to pull the novel in the early 1970s. Fortunately, Stewart and small fine press publisher Alan Ligda quickly got together and brought out a beautiful copy from Ligda’s Hermes Press. The Hermes edition sold well. Random House quickly realized they’d made a mistake and bought the rights back. 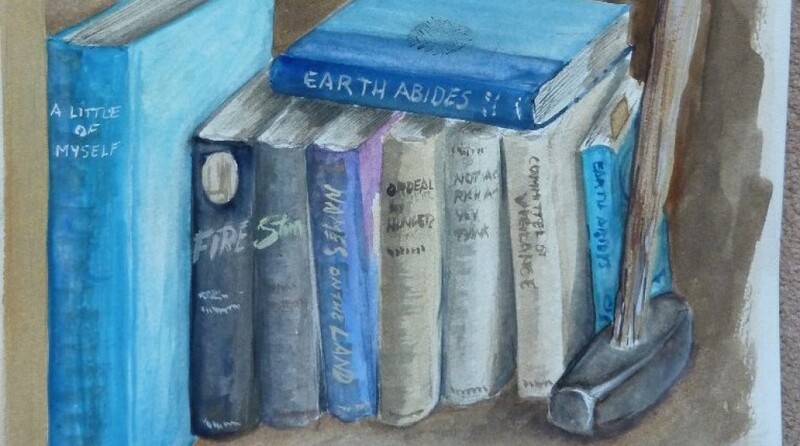 Thanks to Alan Ligda, Earth Abides has been in print for seventy years come next October. He is a Hero of the novel. Sadly, he died young, and won’t be able to help celebrate the book’s Platinum Anniversary. So please take a minute (or more) to say a silent thanks to Alan Ligda while you celebrate the novel. And read the novel again. (You’ll have to do a number of readings to catch up with Steve Williams, the Pilgrim, who doesn’t know how many dozens of times he’s read it.) As you read, reflect on Stewart’s role in raising our consciousness of the ecosystem. His wildly popular ecological novels, Storm, Fire, and Earth Abides, and his less-widely read “post-modernist” ecological novel, Sheep Rock, have shaped our thinking. Like most great creative works of thought, they have more power than all the armies in existence. That pen (or, in Stewart’s case, pencil) is mightier than the sword. By the way – if you want to buy a signed first edition, Morley’s Books in Carson City just happens to have one. It comes with a custom box to protect the classic. Only $1600 – about half the price of another on offer at ABE.